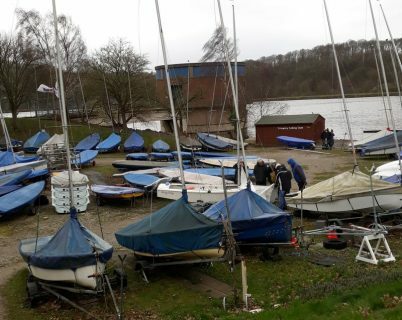 Trimpley Sailing Club is keen to encourage more of its members to join the Midland Bell open series. We currently have only two regular GP14 travellers and invited Chris and Gill Beddow to provide potential travellers with advice and support by organising a half day training session on Saturday 16th March. 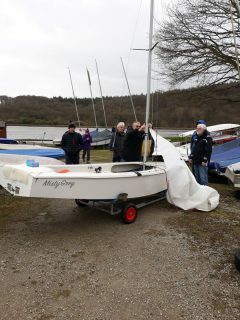 On that windy, but dry March morning twelve Trimpley GP14 sailors gained top tips on everything from how to secure the boom in the boat for easy towing to gybing with a spinnaker. Chris and Gill’s experience in packing up and then rigging a boat efficiently should make travelling easier. We are hoping to have at least four boats qualifying for the Midland Bell this year and will be inviting Chris and Gill back later in the year to provide advice and support on racing tactics, improving starts and rounding bouys. Trimpley is a small club, on a petite reservoir in the Severn Valley. 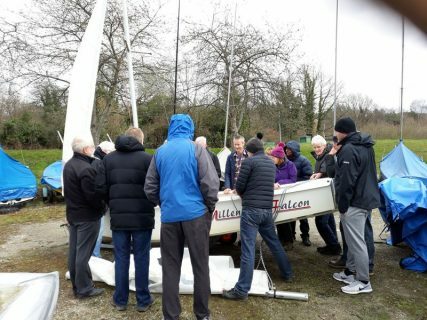 We hope that this practical training will give new sailors the confidence to travel and try out bigger ponds with more consistent winds and enjoy the thrill of racing GPs around the Midlands and beyond – Maybe we can get a few more Trimpley sailors to attend the Nationals too. Many thanks go to Chris and Gill for volunteering their time! Please Note: Training like this maybe useful if you are new to travelling and would like to attend the Cruising & Boat Handling weekend at Bass this August.